When is the best time to buy an underground storm shelter or above ground tornado safe room? Does it even matter? …But guess what: that’s what everyone else who didn’t get their storm shelter ordered yet is thinking as well! That’s fine and all until the next severe weather siren goes off and everyone rushes to the phone, all wanting to order their storm shelter or tornado safe room now! Storm shelters and tornado safe rooms are big, heavy units that require precision in their build to ensure they conform to FEMA requirements and that they’ll withstand an EF-5 tornado. In order to produce such a unit, a large factory with heavy machinery and skilled workers is required and only so many units can be produced at one time, given the amount of materials, space, labor and cost involved (among other things). Because demand relies quite a bit on the severity of the weather and previous storms, there are times of year that are typically slower (when the factory can produce more units than are requested) and then other times of year when it’s the reverse, where demand exceeds the production ability of the factory (like this last March and April, in particular). Like any business subject to such huge swings in demand, it’s difficult to know when demand is going to spike and how many workers you’re going to need or have to lay off. So it’s a little bit tricky and not an exact science. The spiked demand for orders might last a few days from one close call, or maybe a supercell hits and orders last for weeks or a month. Or even worse, multiple supercells hit in different parts of the country all around the same period of time and EVERYONE it seems wants a storm shelter or tornado safe room all at the same time, making it hard to just answer the phone, let alone produce storm shelters. As you can imagine, those times of year are the periods of time you want to avoid. Now, if you’re just not able to get your storm shelter or safe room ordered until that period, just be prepared for potentially long days without any real idea of exactly when your storm shelter or tornado safe room will get to you. As just mentioned, sometimes these demand peaks don’t last too long and production is able to catch up quickly. But if you can at all avoid it, you should! So when exactly are the best times to order a underground storm shelter or tornado safe room? Just like in the investing world, when everyone jumps on and wants to buy something, you probably should have already bought. And it’s the same with buying your storm shelter – you want to do the opposite of the masses. So instead of waiting until the last minute to place your order, do your research now, plan your finances out now or contact us if you need financing, but you want to order your storm shelter or tornado safe room when everyone else isn’t – before the storms threaten! In other words, when you’re NOT thinking about severe weather or thunder storms, that’s a good time to order your tornado shelter or safe room. Why? Because you’ll be able to get your underground storm shelter or above ground tornado safe room within a matter of days or weeks as opposed to possibly months… This way you’re prepared for the typically worst part of the storm season when it arrives, giving you peace of mind and security, instead of fear, worry and uncertainty. The best times of year to buy your underground storm shelter or above ground tornado safe room is June through October and December through January or so. This is typically the best time of year, however, should a big storm develop and cause damage during one of these months, it of course no longer applies because demand will shoot through the roof. Right after storm season, we may still be catching up orders from the demand spike but the months mentioned above are a good rule of thumb. To conclude, the best time to get a tornado shelter or safe room is as soon as you possibly can. This is not hype, it’s simply a fact that severe storms like a Huntsville tornado can take place at any time of year, not just in April or November like many people have become accustomed to. However, if you have to wait and want to know the best time of year to buy your unit, purchase before the peak so you don’t get caught up in the production nightmare that can occur when everyone wants their units at the same time. PS> Did you get your free [email protected] subscription yet? Just fill out the form on the right of this page for your custom, reliable weather alert service (specific to your home, not your whole county) so you know when it’s necessary to use your storm shelter or tornado safe room. Don’t be caught off guard! Which is better? An underground storm shelter? 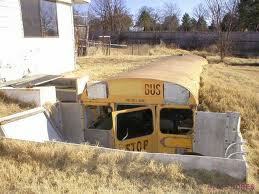 Or an above-ground tornado safe room? You’ve seen the destruction that tornadoes and severe weather can wreak on homes, businesses and entire communities and you know you need better protection from these devastating storms. By now hopefully you’ve also realized that not all storm shelters or tornado safe rooms are created equal. While having some sort of storm shelter or safe room is better than no safe room or tornado shelter, to ensure your family’s safety and survival through even the most dangerous of storms, you need to choose wisely. Most people are familiar with the old type of metal or concrete storm shelter that years down the road now more closely resembles a dungeon than a safe place to ride out severe weather. These older units, while again better than nothing, in most cases were simply not designed or tested to withstand the impact of a strong storm, like a Huntsville tornado. One of the most serious issues is usually the door. With the high winds and blowing debris, you want to make sure your storm shelter or tornado safe room door is impact-tested to withstand both the wind trying to pull it off it’s hinges (requiring a substantial hinge and 3-point locking system) as well as impact from debris traveling at 250mph (like a 2×4 or tree branch), simulating the worst of storms, an EF-5 tornado. So this begs the question, if an above-ground impact-tested tornado safe room can be as safe as an underground impact-tested storm shelter, how do you decide which to choose? The answer is quite simple; it really is a matter of personal preference and space. If you have a 2 or 3-car garage – or even a 1-car garage that you don’t use to park your car in and have the space for a 4×6, 4×4, 4×8 or other sized tornado safe room, then that may be an option for you. Conversly, if you do not have any available space for even a 3 1/2 foot x 4 foot safe room in your garage or on a back patio or something, then an underground storm shelter may be the best option for you. You “feel” safer being underground that above-ground. In conclusion, any way you look at it, a tested, quality underground storm shelter is just as safe as an above-ground storm shelter (assuming you’re dealing with a reputable company with quality products that have been specifically engineered, designed and tested for use as tornado protection); the question you have to decide is which factors are most important to me and which one do I prefer? If you’re still unsure though and would like to discuss your situation with us further to review other concerns or specific issues your house or yard may contain, just give us a call or send us an email anytime by calling (256) 258-WIND (9463) or click on the CONTACT US tab at the top of the page. Hopefully this article has helped you figure out which option may be best for you and your family. Please comment below and let us know your thoughts, your determining factors, etc and also be sure to share this article with anyone else you feel may benefit from it, via facebook, twitter or other means as well. As you’re likely aware from our Lifesaver Storm Shelter Models & Benefits page, we offer a wide range of both underground storm shelters and above-ground safe rooms, from our smallest 4-adult storm shelter to our largest tornado safe rooms that protect up to 100 people (10 x 50 foot tornado safe room). I wanted to put together a quick post to show some of the differences between the smaller Lifesaver storm shelter models (vs the bigger LS-8, LS-10, LS-12 or LS-20 models) in how they are installed to address a few questions that people have had about they are installed. On the Lifesaver Storm Shelters Models & Benefits page, you’ll see an unedited storm shelter install video shot of us installing an LS-12 storm shelter, from digging the hole, to pouring the concrete pad underneath the shelter, to strapping down and back-filling it to complete the storm shelter install. Since we haven’t yet filmed one of the smaller units (LS-4 or LS-6) being installed – and since they have a slightly different install process due to their smaller volume, size and shape and therefore differing buoyancy factors – I wanted to go through the process of installing an LS-6 Lifesaver shelter and show some pictures to help you better understand the process for those interested. Then we begin digging the hole, approximately 10 feet by 12 feet (depending on the location) some 6 feet deep. We shoot grade to make sure the bottom of the hole is the right depth and prepare the tornado shelter to be lowered into the hole (bigger models require bigger, deeper holes). For the LS-4 and LS-6 underground tornado shelter models, this means threading 9-foot long, 2-inch steel pipes through the bottom of the tornado shelters as you can see in the photos. This is part of the anchoring system which is engineering and designed to have 2 fiberglass panels on either side of the shelter sitting on top of the steel pipes to help anchor and keep the shelter in it’s installed location (so it doesn’t float up or move around). The larger Lifesaver storm shelters (LS-8 and above) require a heavier anchoring system which is why we use an 8-inch thick concrete pad underneath the shelter or preformed 2000 and 3000 lb concrete blocks with straps or chains as their buoyancy factor is greater. That concrete would be overkill and unnecessary for the smaller LS-4 and LS-6 Lifesaver storm shelters however and would also unnecessarily increase the cost for the customer. So once the fiberglass panels are in properly, the tornado shelter is level and correctly in place, we backfill the dirt into the hole to bury the underground storm shelter, leaving the dirt around it a few inches high in order to compensate for some of the dirt that will settle (it will take a few rains to really compact and settle the dirt; the shelter does not settle or move, only some of the dirt on top). To ensure each Lifesaver storm shelter is properly installed so we can issue a lifetime warranty on the storm shelter, we include installation in the prices we quote for our tornado shelters, like our LS-4 model (4 adults) which for purchase and normal install is $3500. The LS-6 as pictured in this post for a normal install is $4500. If you have any other requirements, like hauling off dirt, removing trees or shrubs or anything else, feel free to give us a call at 256-258-WIND and we’re more than happy to answer your questions and provide you with more information. Flash.org and CNN got wind of the story and decided to bring out their camera crews to also record this wonderful event. We also were able to capture some great footage of the entire install process from unloading the tornado safe room off the trailer to locating it in place and installing it in Kevin’s garage, which you can view below. As you’ll hear in another video regarding these All Weather Safe Rooms, the installation process is such that you can actually install the tornado shelter in your garage and should you decide to move, you can actually just call us up and we can reinstall your tornado safe room if you like to take the safe room with you to your next house. Or, you can leave it in place and add approximately $10,000 to the value of your home as in the case of the tornado safe room as configured in the video below. Essentially though, with a trained and certified installation crew and the proper materials and tools, installation of the All Weather Safe Room can be completed within an hour or so from start to finish. The unit weighs several thousand pounds (the heavy-duty door itself weighs 350 lbs) so while it may look easy to install in the video, it’s simply the result of using the right tools and understanding the install method to ensure the shelter is installed correctly so that it can protect from a severe Huntsville tornado (even an F-5 Huntsville tornado), as tested by the Texas Tech University Wind Science Center, the premiere tornado testing facility. Once installed, the All Weather Safe Room can not only protect you as a tornado safe room from severe weather as mentioned, but it can also double as a safe (to store valuables like guns, ammunition, precious metals, coins, and other valuables) as well as a panic room in case of burglarly. (We can also custom build safe rooms to guard against fire and larger bullets, if desired). WHAT? Winter? Already Time to Think and PLAN!? Last winter will live in the record books for a long time. Of course, by defnintion, history will last… um… forever. But with another uncertain winter ahead, what should we keep in mind, especially during Winter Weather Awareness Week 2011. Let me remind you that during the winter months it is time to start to prepare for the Severe Weather Season that faces us for 2012. Winter is the time to get things DONE and put to bed. In North Alabama, Southern Middle TN, and the rest of the nation’s tornado belt, it is almost like preparing for War. It is a mindset that people who don’t have to worry about tornadoes just don’t comprehend. But let’s comprehend this. Now, in the TN Valley, we have 2 major tornado anniversaries near 6 months apart. April 27, 2011, compared to November 15, 1989. 2 times of the year that represent the chance for loss and devastation to all of us who live in the Tornado Belt of the Southeast and Mid-South. So this Winter Weather Awareness Week, make sure you are ready for winter… shovels, ice and snow melting chemicals, and the reminders as to how to drive in snow and ice. But, if there is another Tennessee Valley or Huntsville Tornado coming our way, you will be glad that you have spent time planning your entire safety plans. If you need help following the April 27 Huntsville tornado, seek help, and don’t feel embarrassed. The post traumatic stress that is occurring for thousands of our neighbors is real and palpable. If you need assistance, schedule help. It might take months to even start your path to revocery. Make sure that when tornadoes threaten the TN Valley and Huntsville once again, you have a system in place that you don’t have to worry about batteries, turning it on or off, or watching it to get your information. TV is great, but you have to be watching the right station at the right time during the right time of day to get help. Weather Radios? Those of you who have them likely don’t have batteries, have them unplugged due to them going off ‘ALL the time’, or have learned to ignore them due to their county warnings. Sirens… if it is storming, middle of the night, you might never hear them. But a PHONE CALL! You will always awaken to answer a phone call! Get WeatherCall HERE NOW! Leave your information in the form on the right of this page and you will receive a year for FREE. Even if you have notification, you need a place to go. During the EF-5 Huntsville tornado on April 27th, lots of our neighbors lost their lives in the ‘proper shelter’, closets, bathrooms, hallways, etc., but for those in Storm Shelters and Safe Rooms, you don’t hear stories of life disaster from these folks. 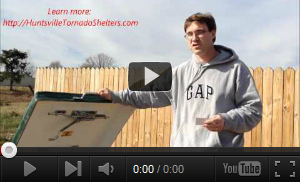 If you can afford one, get one, at Huntsville Tornado Shelters.com, but call TODAY. There are lots of peope scheduling to have them put in. Don’t – do it now. Get it as your Christmas gift for your family. Or if you are in a neighborhood of homes, mobile homes, or campers, pitch in with several, and get a 8, 10, 12, or 20 person storm shelter and share the costs. 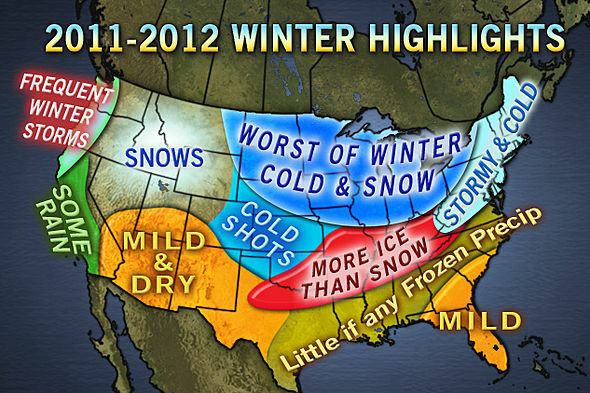 Folks, Winter Weather Awareness Week is a great time to get ready for the War of 2012. Please take it seriously, and spend time checking things off your safety list. It was the afternoon drive on November 15, 1989, as traffic backed up on Airport Road. Unbeknownst to those sitting in their cars while facing east, an F-4 Huntsville tornado was bearing down on them. Residents of South Huntsville along with owners and their employees were facing another business as usual day on a day that just felt eerie. November was not supposed to be that warm, sticky, breezy. Thousands who left for work that afternoon remember the air just felt funny. The weather warning industry still had a LONG way to go. Doppler Radars were just being installed around the country. The National Weather Service did not have the warning technology they have today. And there it was. A “Severe Thunderstorm Warning” that included much of Madison County, in the midst of a Huntsville Tornado Watch. But for all who remember being near Airport Rd. that day, it was a storm that came without warning. 21 souls lost. 500+ injured. Hundreds of thousands of nerves made forever sensitive. And thanks to the hundreds of our friends and families either killed, injured, or rattled by the tornadoes of April 27, the would will never close, as another opens. …a Tornado Warning for your immediate area. The sirens whine, and that old familiar feeling in the pit of your stomach starts again. Today we remember, but today we must also act. Since that day, the National Weather Service has not missed a tornado of that magnitude thanks to amazing warning technology. The warnings are better than ever before, though in many cases, more frequent because of that very technology. The weather vendors around the nation are clamoring for the pocket books of any company willing look ahead to the next tornado disaster, frequently over-charging for their services, driving thousands of companies who want protection out of of the marketplace. If you are looking for the most afforable, highest quality emergency weather notification system in the nation, look no further than WeatherCall Enterprise. An outgrowth of the wildly popular and proven life-saving WeatherCall product offered by 80 TV stations across the nation, WeatherCall Enterprise takes the exactness of NWS storm specific warnings, and creates a 24/7 automated monitoring and notification system that provides safety at a never before seen price-point. Why? To allow companies who feel overwarned and underserved by traditional warning systems or overcharged by traditional notification companies a choice to keep their employees safer and their business operations more predictably smooth. While you are here, take time to leave your contact information and take home a year of WeatherCall @Home free. Contact me, former WAAY-31 Chief Meteorologist Brad Huffines, about WeatherCall Enterprise, and what it can do for your business, and how affordable peace of mind and OSHA compliance really is. You can find me at 256-444-1234, or by email at [email protected]. From 4 to 20 person shelter capacities, you will be surprised how affordable they really are, especially for your business (community safe rooms for 50 or even 100 people also available there, as well as above ground safe rooms). Thanks to the NWS technology, WeatherCall, and modern communications devices, larger tornadoes will seldom surprise again. So the next time a Tennessee Valley or Huntsville tornado threatens, and they will… you will be prepared, and with a storm shelter, you will have a place to go. Remain Safe by Planning to BE Safe. Folks, I have so few words and so many emotions this morning. when meteorologists, first responders, treating doctors and nurses, and social workers, dropped to their knees after emotional exhaustion set in dropping them to their knees in helplessness, we all lost what was left of our deniability and weather innocence. To those Huntsville tornado survivors, who cannot get the sound of losing all they have, in some cases, family and friends, I pray for you today. To those who lost friends and loved ones that day and the days after, when lingering lives were taken away, I pray for you today. To the first responders and to the National Weather Service, who did ALL THEY COULD that day, days leading up, and days after, I pray for you. To all who’s innocence was stripped to nothing that day, I pray for you. If you can afford it, get a Storm Shelter. If you cannot afford a storm shelter or safe room, talk to friends and neighbors, and go in together on a big one (like an LS-20 underground storm shelter). Most importantly, sign-up for WeatherCall (for free at huntsvilletornadoshelters.com when you leave your email address or just look to the right of this page if you’re already on the site) and learn to depend on it. The best way to prepare for another Tennessee Valley or Huntsville tornado is to leave the Valley and get the proper training. That is the mission of the Emergency Management Institute at the National Emergency Training Center in Emmitsburg, MD. Here, teams of instructors all have real life experience in dealing with natural and man-made disasters. Being the only broadcast meteorologist to ever instruct for the Emergency Management Institute, I have a very unique take on emergency information and public information, and how the two work together. It is my 15 years of FEMA instruction and my 27 years as a broadcast meteorologist that brought me to actively market WeatherCall’s family of products, from WeatherCall for your Home to WeatherCall Mobile with Lightning Detection to WeatherCall Enterprise, the uniquely affordable weather risk solution for businesses of all sizes. And knowing that EF-5 tornadoes, which frequently visit Huntsville and surrounding areas, have an above ground survival rate of as little as 20%, the best way to insure your family’s LIFE during a Huntsville tornado is to have the best notification in the nation and the best storm shelter in the country, Lifesaver Storm Shelters of North Alabama. This week at the EMI in Emmitsburg, MD, we are teaching emergency managers, police, fire, EMS and community services from local communities from across the country (and even from the military, NOAA, and the CIA) how to better work together before, during and after a disaster. The poor fictitious residents of Central City, in Liberty County, in the fictitious 51st state of the United States called Columbia, will once again get SLAMMED by a series of explosions, car accidents, chemical plant eruptions, massive outdoor public events, a high rise fire that will take several more lives and injure scores. By doing this, we are giving these students, some very well experienced public and civil servants, experience with stress, problem solving, and bringing solutions. What do I take away from this training? More learning, more friends, and more people with whom I will be in contact for life in our joint efforts to make Americans safer before, during, and after disasters. One thing about facing a Tennessee Valley or Huntsville tornado threat. We KNOW they will come again… and again. YOU need to prepare for their inevitability by getting WeatherCall and a Lifesaver Storm Shelter. Act TODAY. If you are interested in FEMA training and serving your community, go to the FEMA Training Website, and learn more. Perhaps one day you’ll be in one of the classes I teach. Or even Vice Versa! When the Fall Severe Weather starts up again, which it will and always does, you need to know when to be prepared for the worst. But preparing yourself is only part of the battle. Having WeatherCall and a Lifesaver Storm Shelter is only part of the battle. The fact that you are reading this blog shows you have an interest in weather and protecting yourself from the dangerous effects of thunderstorms, lightning, tornadoes, and damaging winds. 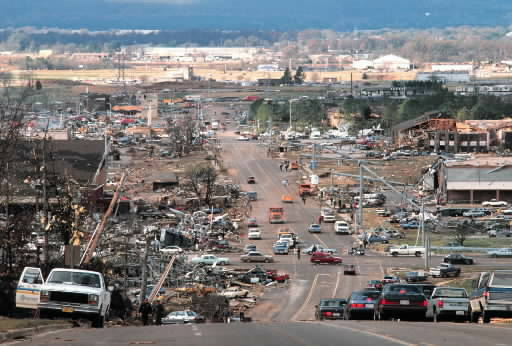 Remember, it was November of 1989 when a Huntsville Tornado killed numerous people on Airport Road. It was a storm that at the time came with only a Severe T-storm Warning, before a Tornado Warning was issued after the damage path was well underway! And for many, having an underground shelter or safe room is great, but knowing when to take shelter from the storm is of utmost importance. Not all thunderstorms are the same and certainly there are an almost infinite numbers of ways tornadoes can look, mask themselves, or even imitate other cloud types. By going to one of the NWS Spotter Training classes, you can learn how to spot the tornado lookalikes, and learn how to report the information you see with your own eyes. Frequently, it is a report about a Huntsville tornado from someone like you that either keeps the NWS from issuing an unnecessary warning, or gives the forecaster that vital information to activate a warning, activating WeatherCall’s Life-Saving notifications, and telling people to seek their safe place, safe room, or storm shelter. So take the time to find a Spotter Training near you and go learn to contribute to the warnings process. It could save your life and the lives of hundreds of others. Lifesaver Storm Shelters of North Alabama is teaming up with the nation’s #1 emergency weather notification service, WeatherCall, through Huntsville Tornado Shelters.com in an effort to help keep more people safe, helping more people get shelter from the storm, as in the next Huntsville tornado. WeatherCall has already made over 6 MILLION phone calls and delivered millions of text messages and emails to its hundreds of thousands of subscribers nationwide since its launch in 2008, literally saving the lives of countless families and individuals. Because of the life-saving nature of storm shelters and emergency notification phone calls, Huntsville Tornado Shelters.com and WeatherCall have teamed up to provide a unified and powerful force in tornado safety that is thriving in the Tennessee Valley and across the Southeast. This partnership will provide unparalleled safety and certainty to our current and future customers by not only ensuring accurate and precise address-based custom weather alerts so there’s no wasted time, energy or stress trying to figure out where the storm is or how severe it is, but also ensuring that when the time comes to take shelter from the storm, our customers will have peace of mind with our lab-engineered and real-world tested top-of-the-line underground storm shelters, knowing they’ll be safe and comfortable until the severe weather passes. When the time comes, there will be no second-guessing; our customers will know where to go. WeatherCall is an ADDRESS SPECIFIC notification service that will actually call you with a weather warning when your specific address is placed within a National Weather Service defined tornado, Severe Thunderstorm or Flash Flood Warning (when your home is inside one of those red polygons on the radar map). That phone call has a history of saving lives in the years since WeatherCall was launched. Huntsville Tornado Shelters.com has six different underground shelters available, all certified and tested to exceed FEMA 320 standards, for anywhere between 4 and 20 persons. These high-quality storm shelters have proven their durability, reliability and safety as evidenced by these photos taken after an EF-5 swept through this property. Everyone deserves to have somewhere safe to go in the event of severe weather like a Huntsville tornado, so with that in mind Lifesaver storm shelters of North Alabama has made these underground shelters and safe rooms as affordable as possible – a 4-person shelter installed for as little as $3,500 for example (credit cards accepted and financing is available for qualified purchasers as well). When you leave your name, phone and email in the form to the right of this page, Lifesaver Storm Shelters of North Alabama will contact you to arrange a viewing of one of their premier underground shelters at your home or business with no obligation or cost to you. Also, as our way of saying thanks for visiting Huntsville Tornado Shelters.com, we’ll give you access to WeatherCall @Home for free for an entire year – just fill out that form to the right. In that email, you’ll also see a few powerful testimonials from real people with real stories about how weathercallsaved their lives. We believe that everyone who has a storm shelter needs to know when to take shelter from the storm, and everyone who has WeatherCall needs to have a place to go to assure their safety. Please don’t overlook this amazing tool. Especially since through Lifesaver Storm Shelters of North Alabama, and Huntsville Tornado Shelters.com, you receive your first year of WeatherCall @Home for free. Make sure to take advantage of this life-saving service. It honestly could, literally could, help you save your own life. Lifesaver Storm Shelter – with Cable TV? With a Lifesaver Storm Shelter, you can not only protect you and your family in the event of a Huntsville tornado or severe weather but you can take shelter from the storm in style! Take a look at the inside of one of our 12-person shelters as installed for one of our Lifesaver storm shelters of North Alabama customers below. There is an endless number of customizations you can have with our underground shelters, from wiring it with TV and cable as our customer here did, to pouring a concrete patio around it, planting shrubs or sod, or even painting it your favorite color (or turning it into the ultimate collegiate banner – I’m talking to you SEC football fans!). Just imagine the look on your neighbors’/friends’ faces when they come over to find a massive 5-foot by 3-foot crimson Alabama banner or orange Auburn banner (your painted shelter lid) prominently displaying your passion and joy? Your shelter doesn’t have to stay green – use your imagination! The possibilities for customizing your underground tornado shelter are endless. We want to smash the notion that underground storm shelters, tornado shelters, or safe rooms have to be scary, damp, undesirable places. After all, you shouldn’t have to think twice about actually USING your storm shelter – kind of defeats the purpose, right? We’re confident that should you decide to choose an underground shelter from us at Huntsville Tornado Shelters .com and Lifesaver storm shelters of North Alabama, that you’ll be so happy and satisfied with your investment that you’ll not only not hesitate to use it when necessary but that you’ll be sharing with your friends and family about it. Experience the quality and superiority of our underground storm shelters yourself with no obligation. Just fill out the form on the right of this page and we’ll happily bring one of our Lifesaver Storm Shelters to your home or business for you to touch, smell and feel the difference. Got Any Other Lifesaver storm shelter Customization Ideas? So how would you like to to customize your Lifesaver Storm shelter? At Huntsville Tornado Shelters .com, we take pride in helping to keep you safe by providing you with the best protection from severe weather possible (like a Huntsville tornado), at a price that’s affordable, and in the way you want it. If you’ve got some creative ideas or suggestions, just jot them down in the comments section below, we’d love to hear what you think! And by all means, please share this post with others so they too can see what is possible today with a Lifesaver underground storm shelter from Huntsville Tornado Shelters .com!